I love the idea of changing the purpose of a cookie cutter. For instance, a flower cutter is usually used to create beautiful flower-shaped cookies, isn’t it? But and if we think beyond that and we find another uses? 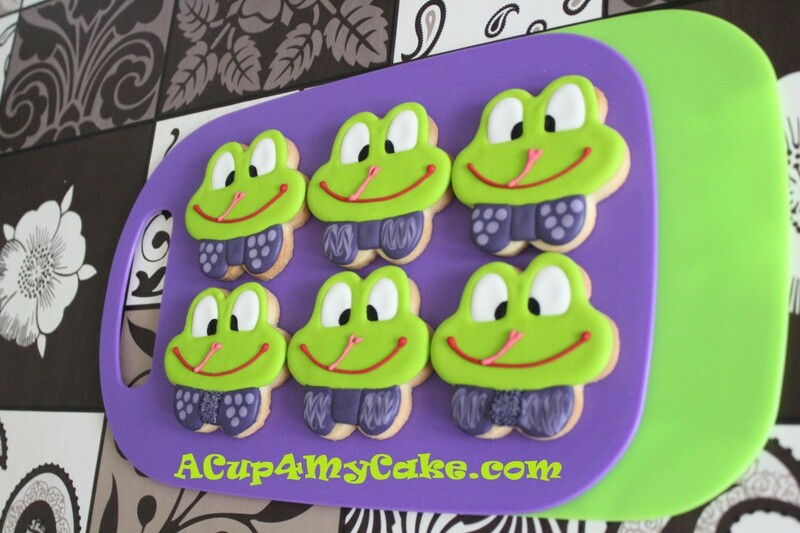 We could save a lot of money in cookie cutters! That’s also a wonderful way to develop your creativity. 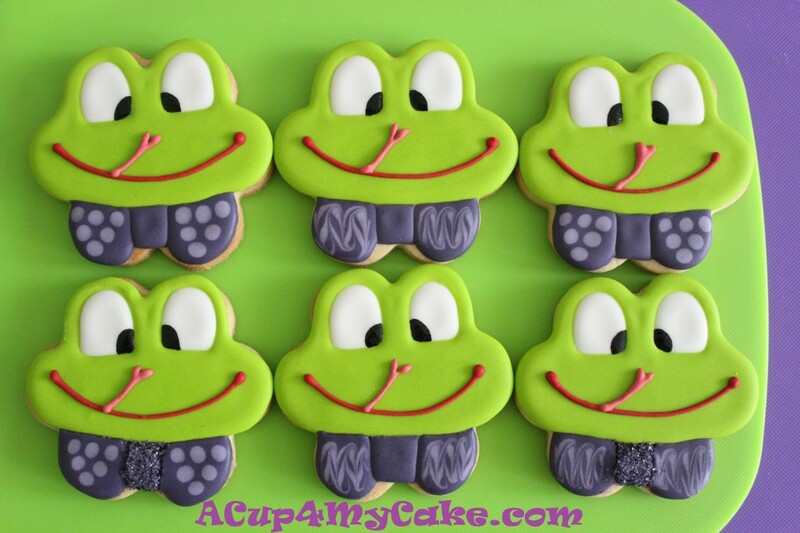 What I recently did was to use a plain flower cutter to create frog cookies. 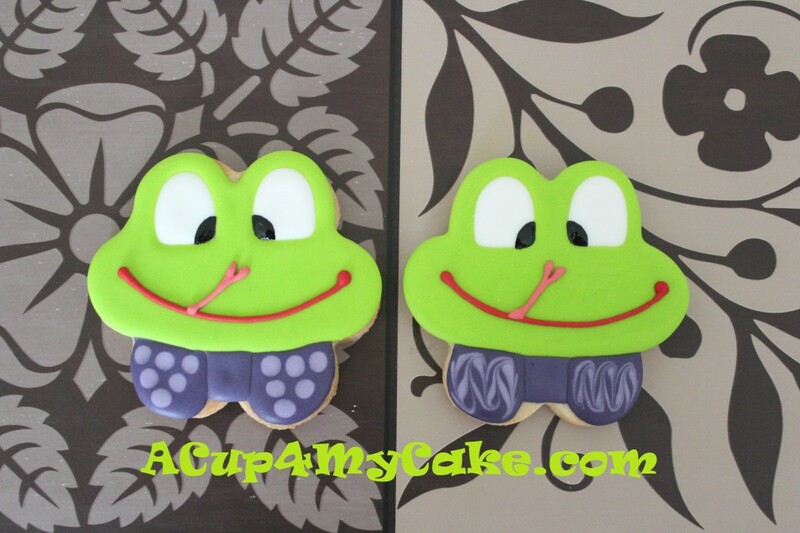 I was staring at the cutter for a while and the idea appeared suddenly: cute frogs wearing a bow!! Don’t you believe me? I chose two complementary colours to match the composition. 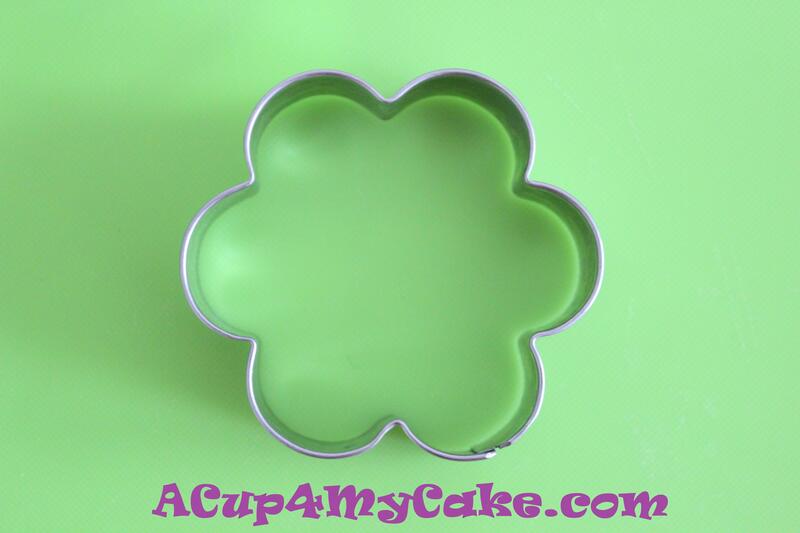 1) Using a flower-shaped cutter like this, make some flower cookies. Bake them and leave them to cool before decorating. 2) Mark the cookie with the details you want to pipe, using an edible marker or a scriber (as a guide when piping). 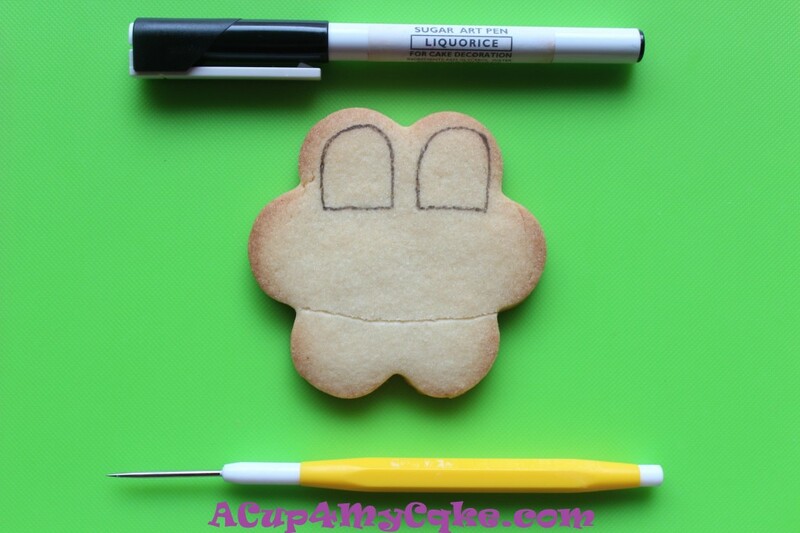 3) Pipe the eyes with white flood royal icing (use a scriber to spread the icing evenly and to remove any air bubbles) → Let it set for 30 minutes before starting the next step. 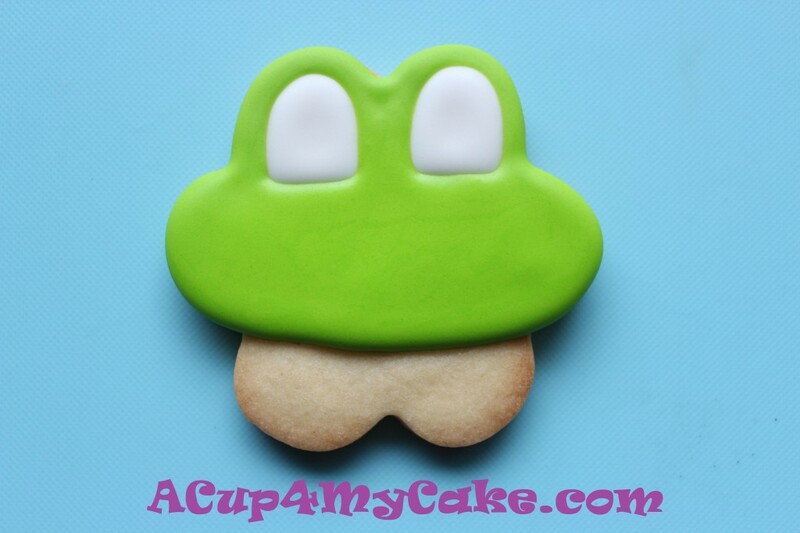 4) Pipe the face with green flood royal icing (use a scriber to spread the icing evenly and to remove any air bubbles) → Let it set for 30 minutes. As you can see, I don’t pipe outlines, I flood straight away. 5) Pipe the center of the bow with dark violet flood royal icing. Optional: add some coloured sugar before the icing dries and it’ll be attached straight away → Let it set for 30 minutes. 6) Pipe both sides of the bow with dark violet flood royal icing. Straight away, use the wet on wet technique: pipe some dots with light violet flood royal icing or pipe two horizontal lines instead and marble the pattern with a scriber (upwards and downwards motion, from left to right) → Let it dry. 7) When the cookies are dry enough (after 6-12 hours) pipe the mouth with red medium consistency royal icing (soft peaks) → Let it set for 15 minutes . 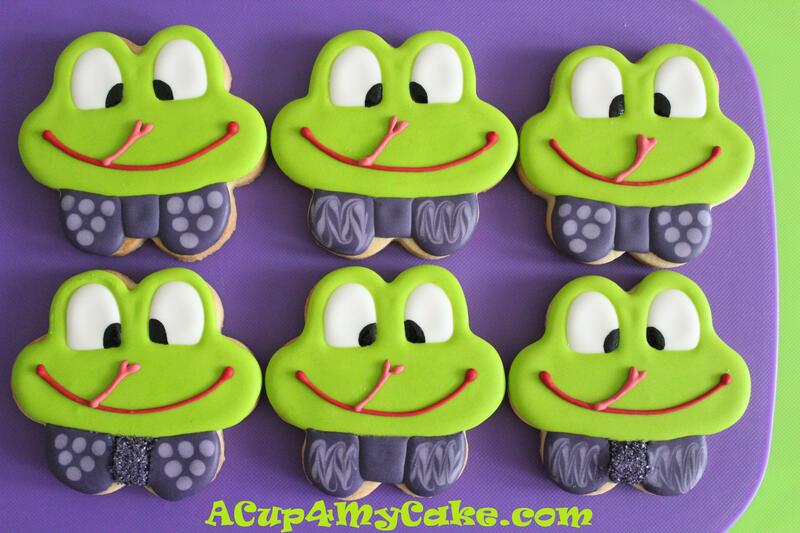 8) Pipe the tongue with pink medium consistency royal icing (soft peaks) →Let it dry. 9) Paint the pupils by using a toothpick and black food coloring → Let it dry completely for some hours before wrapping. As another example to use a cutter with different purposes than the usual one, in a previous occasion I used a simple heart-shaped cutter to make underwear cookies. 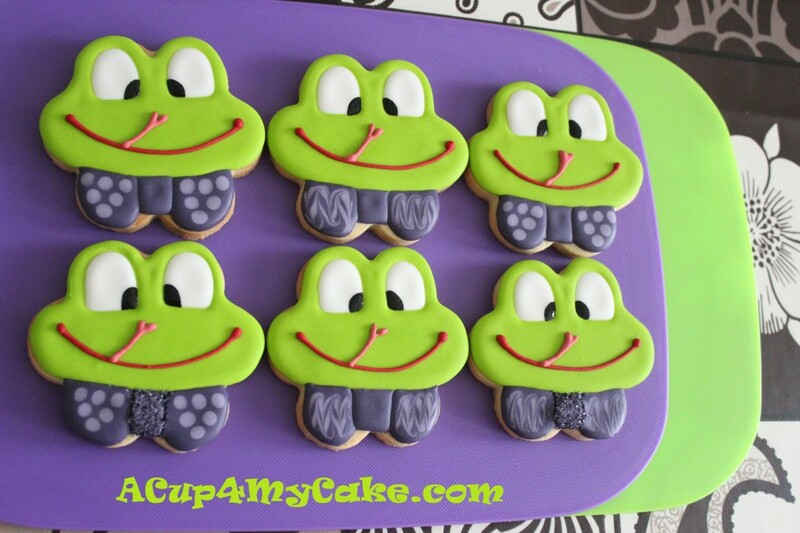 Anyway these frogs are more genuine! They were designed using my imagination! This entry was posted in Animals, Biscuits, Cookies, Funny, Royal Icing. Originalísimas y con el nivel de perfección que siempre le das a todo. Sari!!! cada día te superas, seguro que tiene que haber una salida comercial para estas maravillas!!! Te felicito! Dori!! Qué alegría leer vuestros comentarios por aquí, me ha hecho mucha ilusión. Aguantando la lagrimita que estoy ahora, jeje. Sí, la verdad es que esa salida existe y me gustaría sacarle partido en un tiempo, todo llegará.